Mr. Rees said that several months ago he was in his shed when he heard a voice saying ‘hallo.’ As there was no one else around, he suspected he was hearing things but the ‘hallo’ came his way a second time. Then, as he looked around, Mouse was the only one in the building and amazingly, there was she greeting him again. After having changed her destiny by learning to say ‘hallo,’ Mouse is now embarking on a recording career by releasing a CD of dance tracks, which were recently played on the Bridge FM Radio Station in South Wales. The talented pig is also being considered for film roles. Experts say that Mouse’s “talking” may be due to an odd-shaped voice box. Yet she is not the only animal with the gift of speech. For instance, the owner of a four-year old terrier named Molly told The Sun of her astonishment when the little dog said ‘ello’ while she was on the phone with her sister. 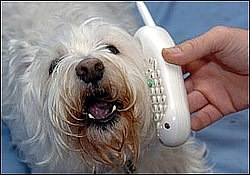 Now Molly loves talking and amazes callers by repeatedly yapping the greeting, with a Chinese twang, whenever her owner is on the phone, and the owner now wants to train her to actually pick up the phone and answer it. While experts try to explain the fact of animals speaking in physical terms, it is obvious that with or without odd-shaped voice boxes, animals can not really “talk” even with an accent. Instead, the one speaking in these animal bodies is invisible to the physical eyes, and the fact that our fellow creatures are beginning to pick up human language to communicate is but one of the many phenomena reflective of our planet’s entry into the Golden Age. Through God’s grace, all of Earth’s creatures are being elevated, and the evolution of human and animal consciousness in turn helps all beings to progress further, as shown by the fact that Mouse’s owner could not bear to kill her for meat after hearing her speak. 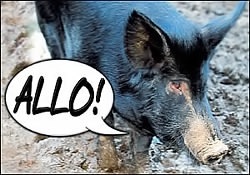 This simple greeting from one of our animal friends is thus a signal of the current era when all of creation is coming to live in love, peace and harmony.